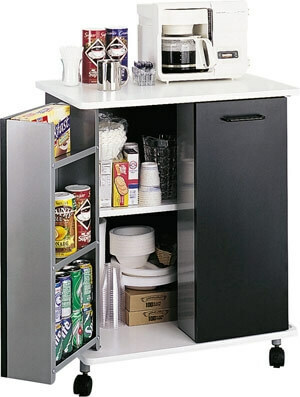 With on-the-door storage and large cabinet interior with an adjustable shelf make this refreshment stand an asset in any office. Large melamine top can hold a microwave or other break room equipment. Double doors feature three built-in steel shelves with lip to keep contents in place. Interior shelf measures 25"W x 11-3/4"D and is height adjustable. Four swivel casters (2 locking). Laminate cabinet with aluminum trim and white easy-to-clean melamine service top. Assembly required.